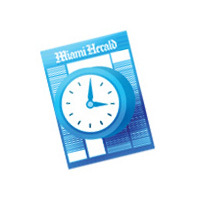 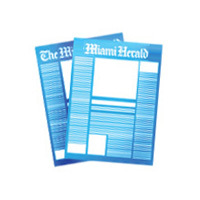 In 1972, it was Miami Beach’s turn to host, not only the Democratic but also the Republican convention, which had also been held here in 1968 — thanks to Key Biscayne part-time resident Richard M. Nixon. 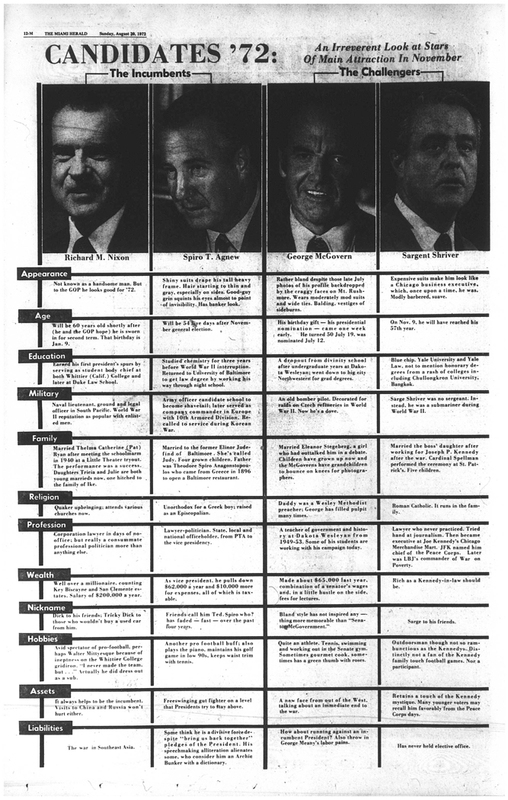 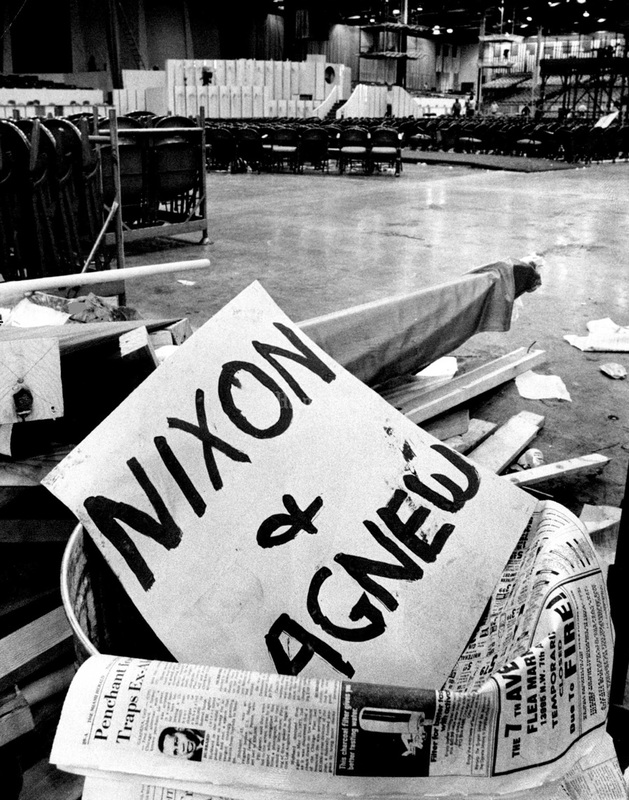 Nixon was running for reelection, along with his vice president, Spiro Agnew. By then the protesters’ numbers had nearly doubled since the Democratic convention a month prior, and they were angrier. 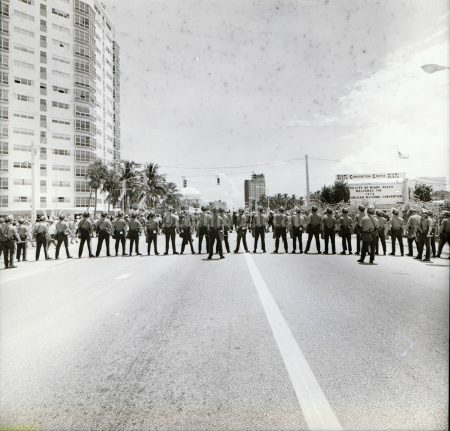 On the night before the Republican Convention began, protesters surrounded Mike Thompson’s new Lincoln Continental as he drove five other orange-jacketed Florida delegates by the Fontainebleau Hotel. 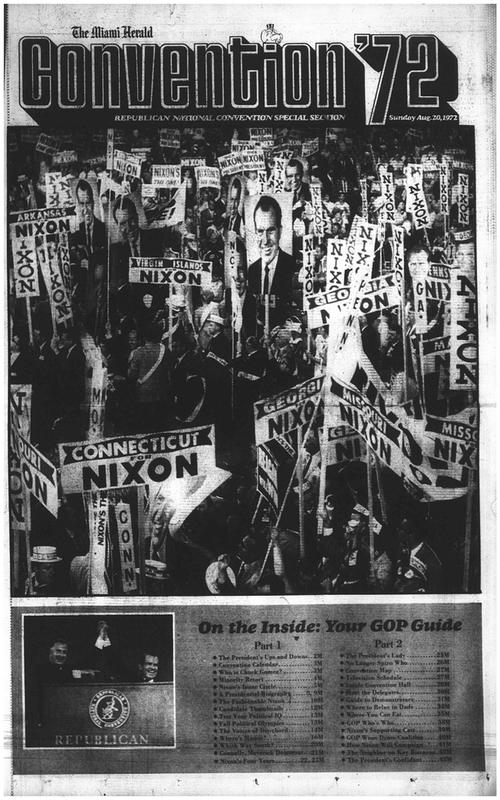 The following night, hundreds of Vietnam veterans marched on the convention center in the rain, chanting, “Bring our brothers home.” A night later, when delegates formally nominated Nixon, the protesters turned the heat up a notch, shattering windows and denting cars outside the convention hall. 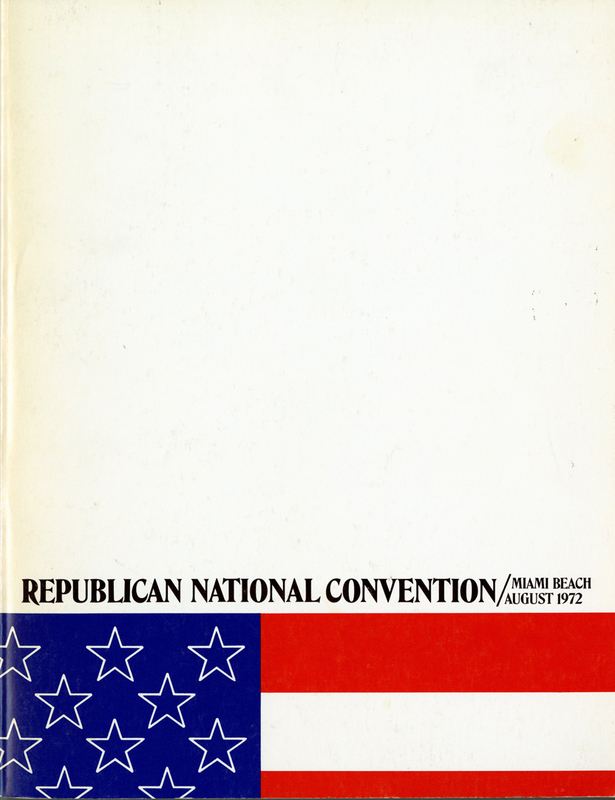 The Republican delegates felt terrorized. But all of them made it into the hall, and the convention went off as planned. 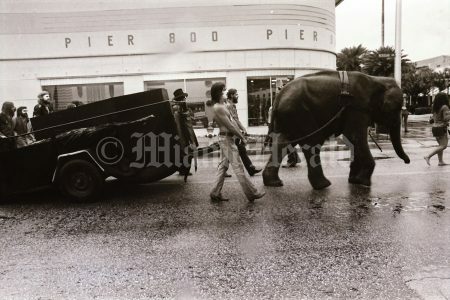 8/1972: Protesters march with elephant down Meridian Avenue in Miami Beach. 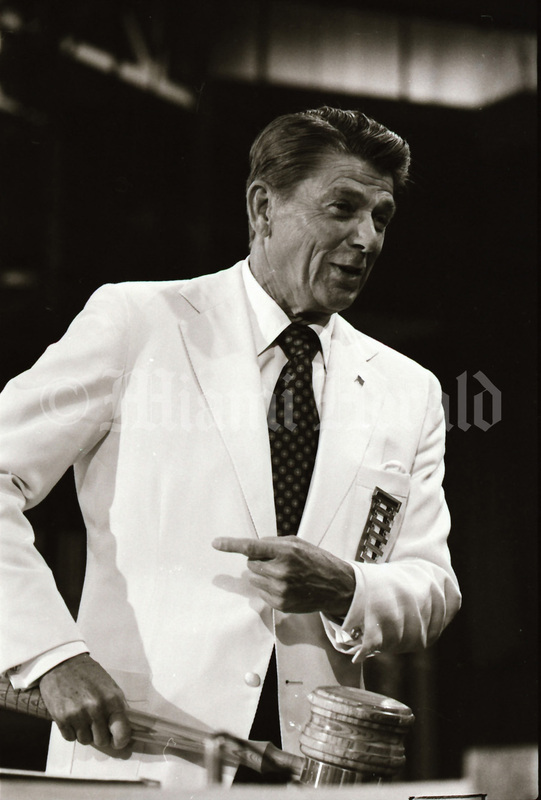 8/1972, Miami Herald: Ronald Reagan holding the gavel at the Republican convention. 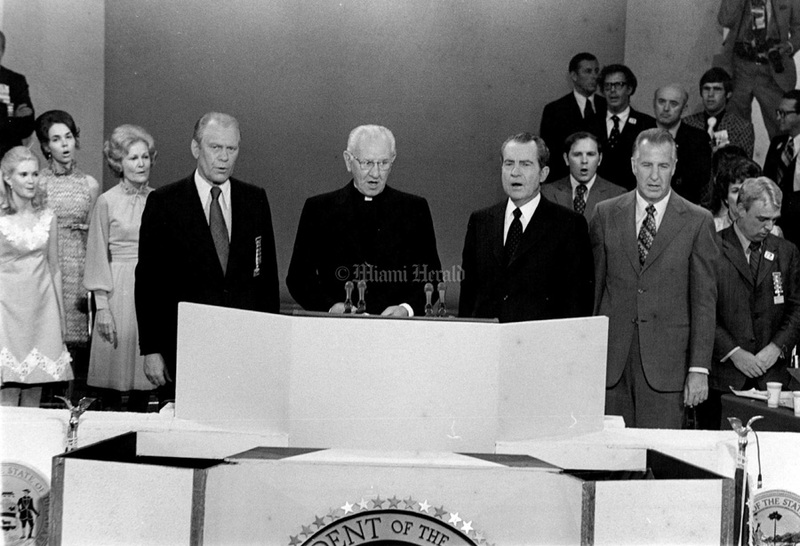 8/1972, Miami Herald Collection, HistoryMiami Museum: Special counsel to the president, Charles Coulson. 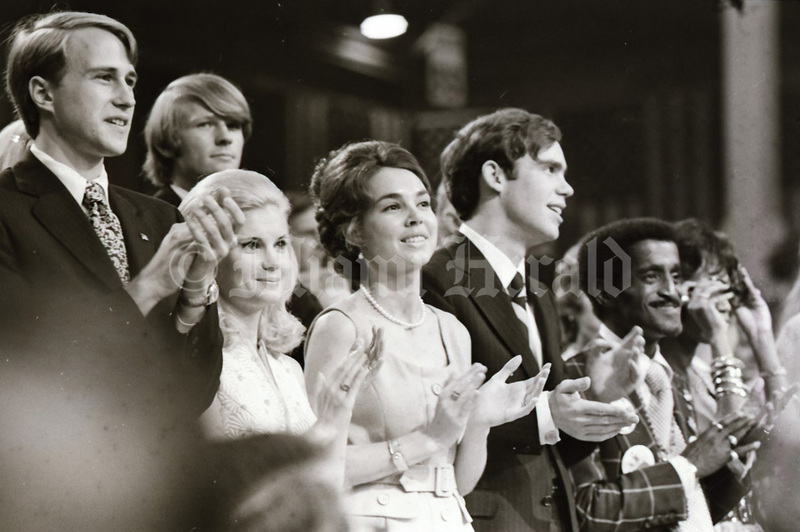 8/1972, Miami Herald Collection, HistoryMiami Museum: The Nixon daughters, Tricia, left, and Julie, right, with their husbands and, far right, entertainer Sammy Davis Jr., applaud durinng the convention. 8/1972, Miami Herald: Richard Nixon and Spiro Agnew on the right at the Republican National Convention with Gerald Ford. 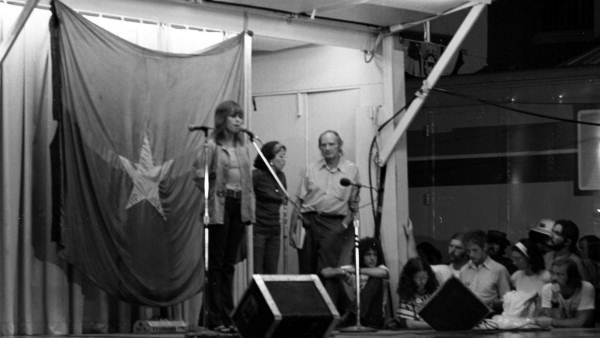 8/1972, Florida State Archives: Jane Fonda speaking to anti-war demonstrators at a rally in Flamingo Park. 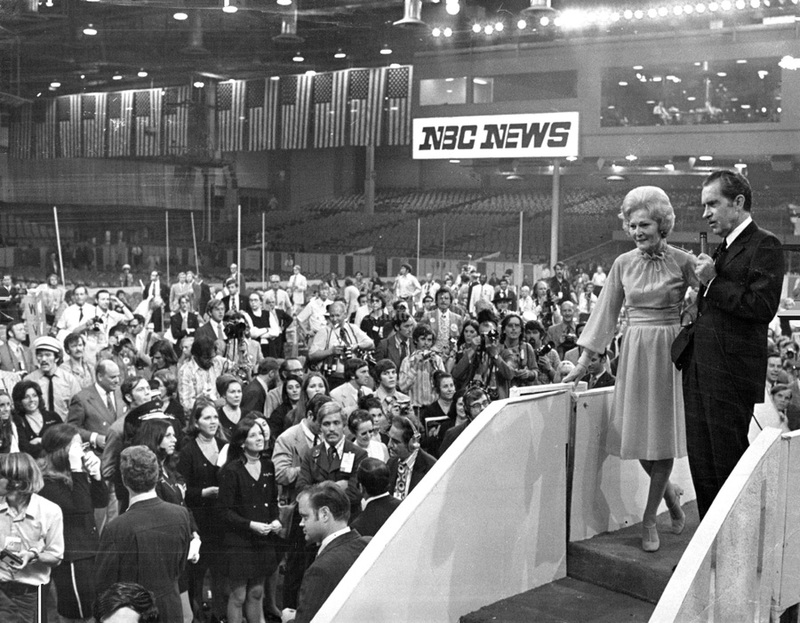 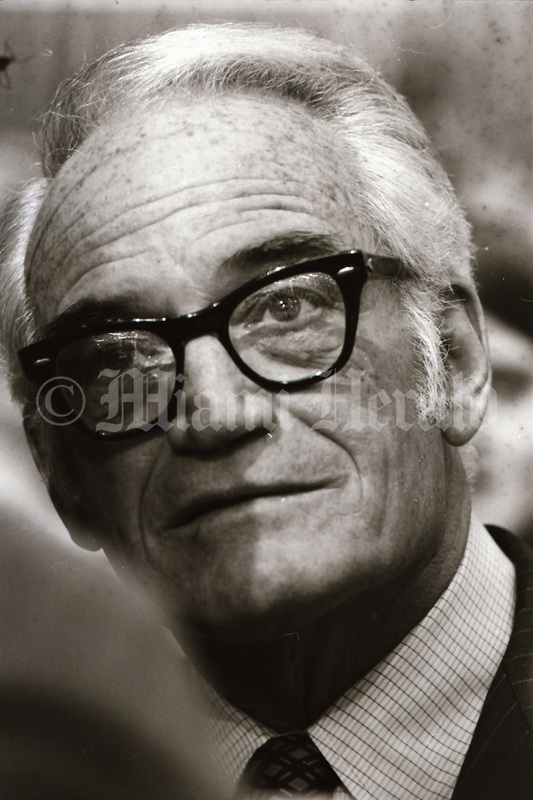 8/1972, Miami Herald Collection, HistoryMiami Museum: Barry Goldwater at the Republican National Convention. 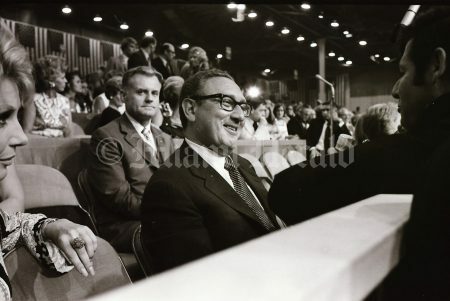 8/24/1972, Mike O'Bryon/Miami Herald: Republican convention hall. 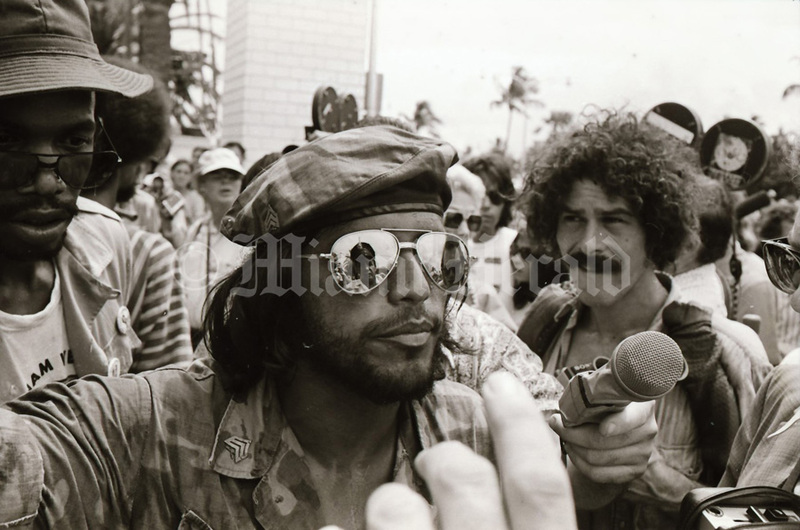 8/1972, Miami Herald Collection, HistoryMiami Museum: Protesters talk with police outside the Republican convention. 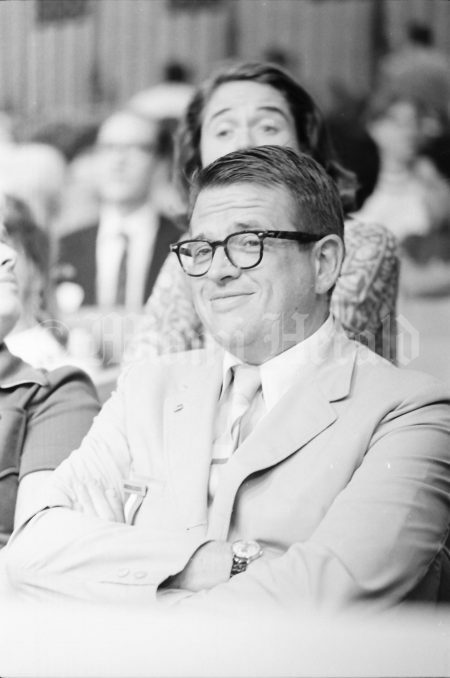 8/1972, Miami Herald Collection, HistoryMiami Museum: Henry Kissinger at the Republican convention. 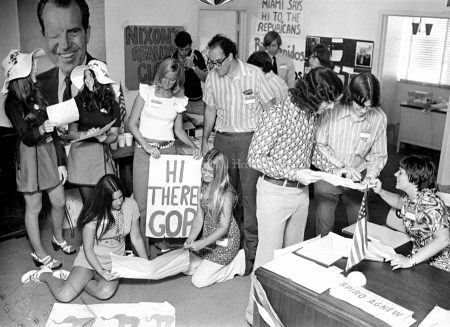 8/1972, Miami Herald: Many young kids at work at GOP HQ on Chase Avenue in Miami Beach to prepare for convention. 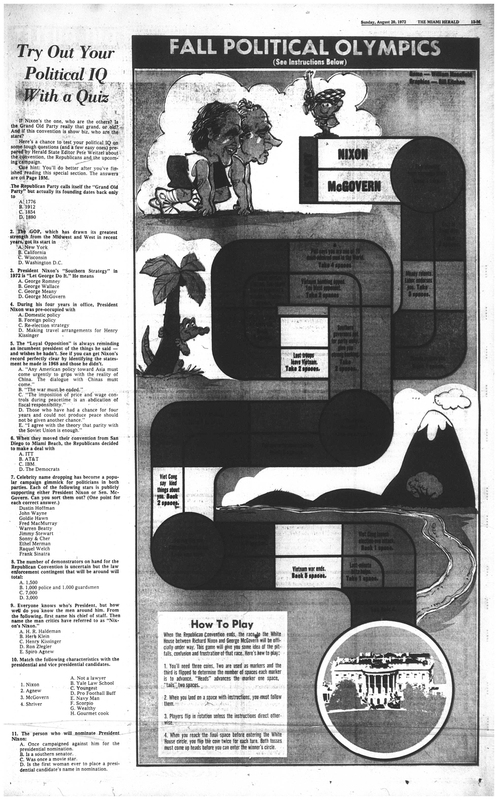 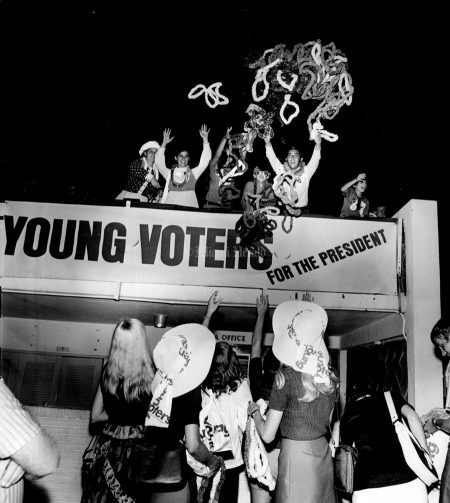 8/21/1972, Roy Bartley/Miami Herald: Youth at the Republican convention in Miami Beach. 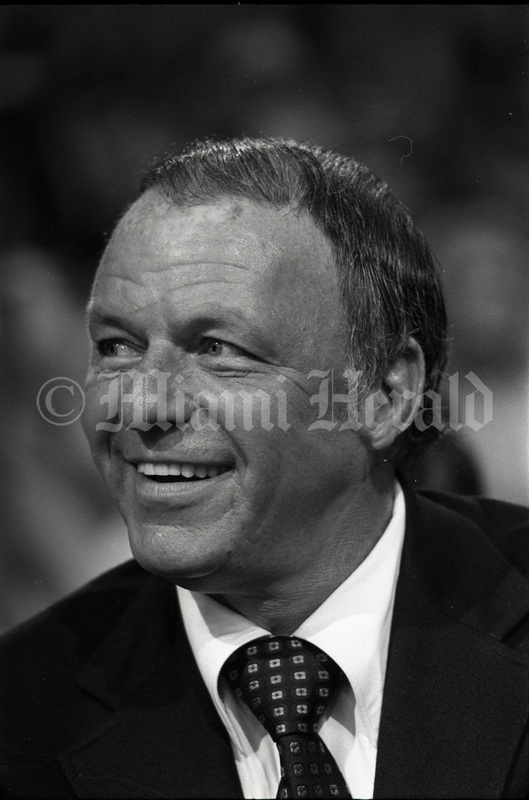 8/1972, Miami Herald Collection, HistoryMiami Museum: Frank Sinatra at the Republican convention. 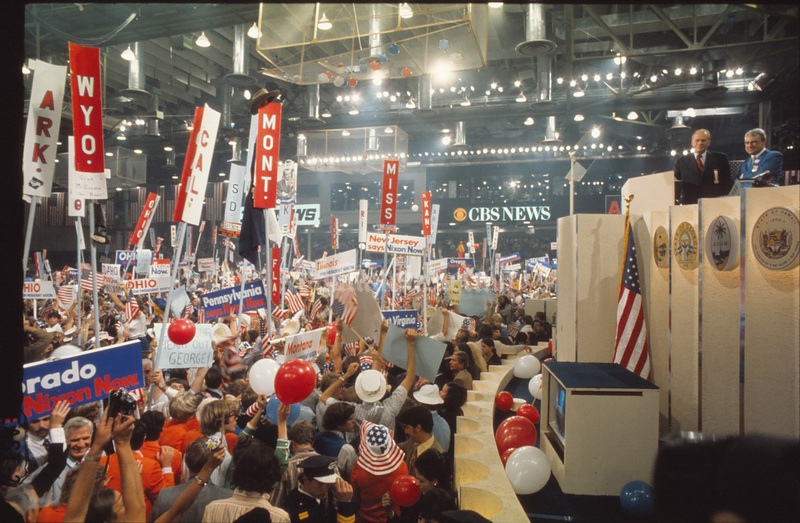 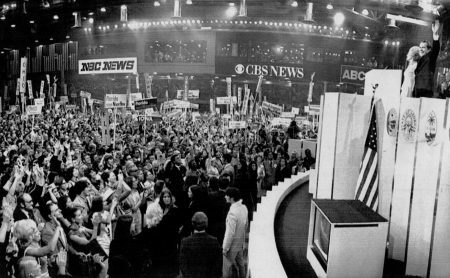 8/1972, Miami Herald Collection, HistoryMiami Museum: A view of the delagates on the convention floor. 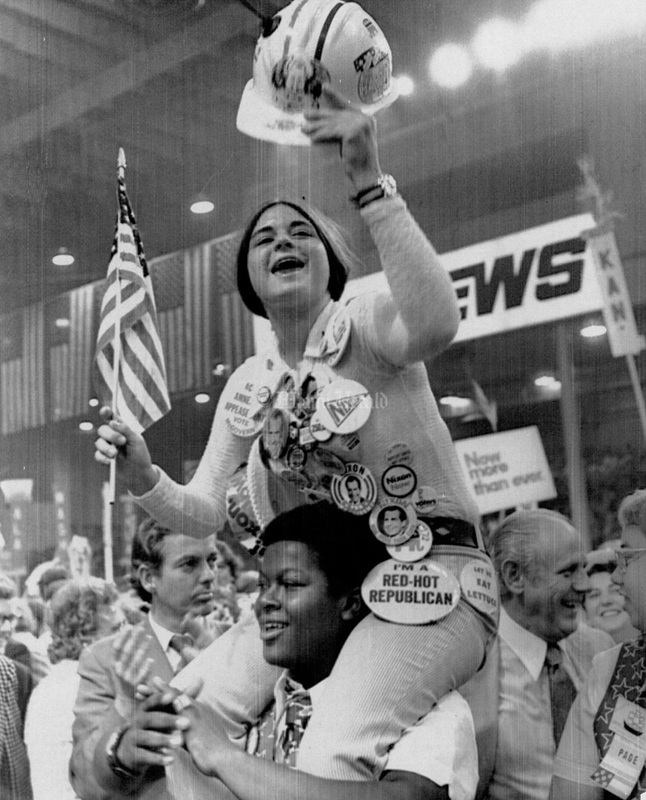 8/1972: A girl festooned with campaign buttons gets a ride on the shoulders of a youth around the floor of the Republican National Convention. 8/19/1972, Bob East/Miami Herald: Nixonettes, the girls who helped cheer on Nixon, register for Youth for Nixon parties. 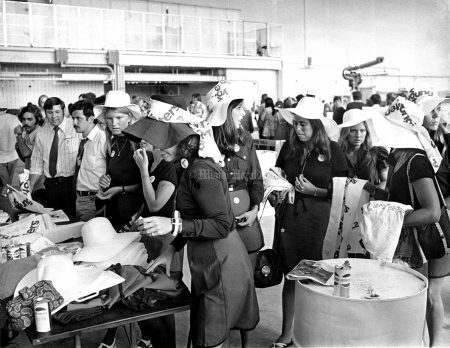 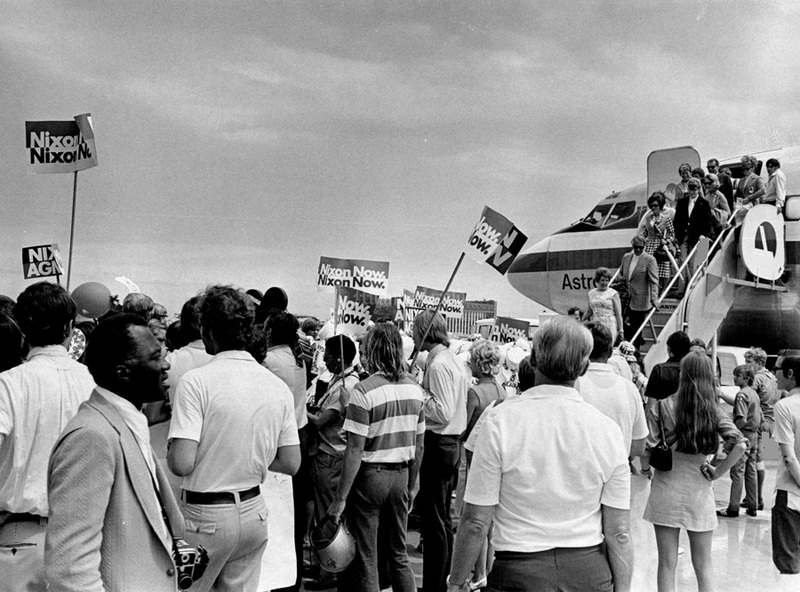 8/19/1972, Bob East/Miami Herald: Illinois delegation arrives at Eastern Airlines hangar. 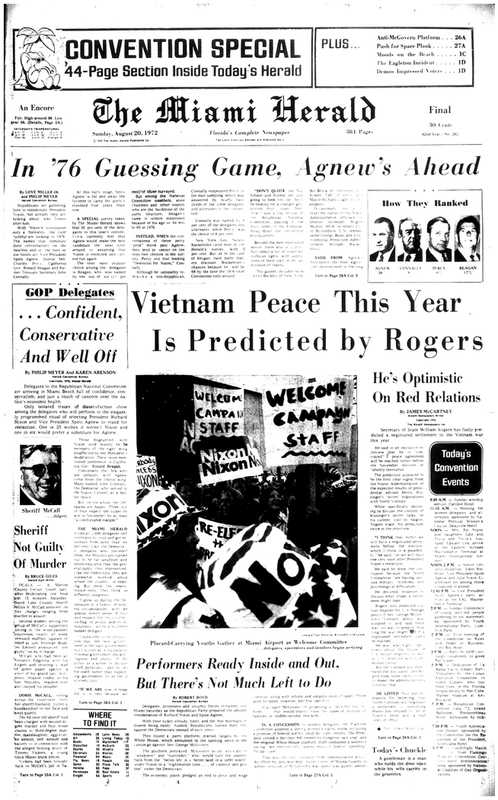 8/24/1972, Bob East/Miami Herald: After shaking hands for a half hour or more, Pat and Nixon say they will go only for 10 minutes more - they were tired. 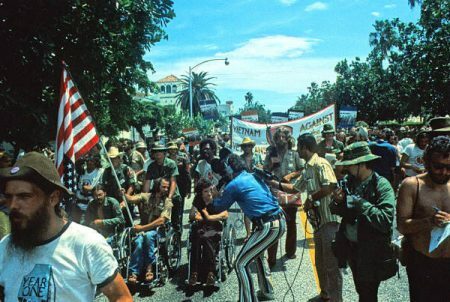 8/1972, Florida State Archives: Vietnam veteran and author of Born of the Fourth of July, Ron Kovic, was tear gassed and roughed up in a veteran's march during the Republican convention. 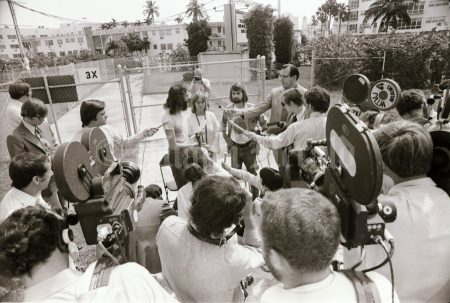 8/1972, Miami Herald Collection, HistoryMiami Museum: Yippie Party leaders speak to the press. 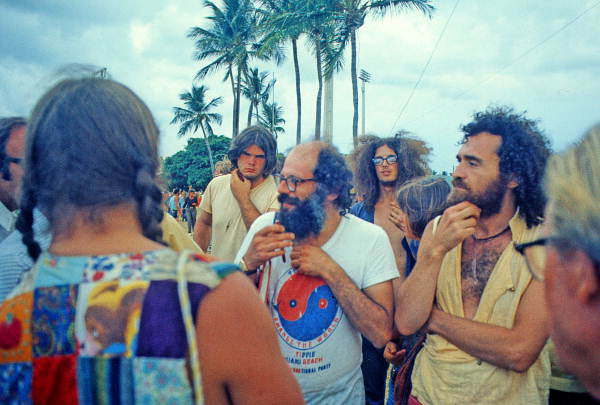 8/1972, Florida State Archives: Poet and activist Allen Ginsberg with the protesters in Miami Beach.